Name of a Canaanitish god. Peor was a mountain in Moab (Num. xxiii. 28), whence the special locality Beth-peor (Deut. iii. 29, etc.) was designated. It gave its name to the Ba'al who was there worshiped, and to whose service Israel, before the entrance into Canaan, was, for a brief time, attracted (Num. xxv. 3, 5; Ps. cvi. 28). The god is himself also called "Peor" by abbreviation (Num. xxxi. 16; Josh. xxii. 17). It is commonly held that this form of Ba'al-worship especially called for sensual indulgence. The context seems to favor his view, on account of the shameful licentiousness into which many of the Israelites were there enticed. But all Ba'al-worship encouraged this sin; and Peor may not have been worse than many other shrines in this respect, though the evil there was certainly flagrant. In Hosea ix. 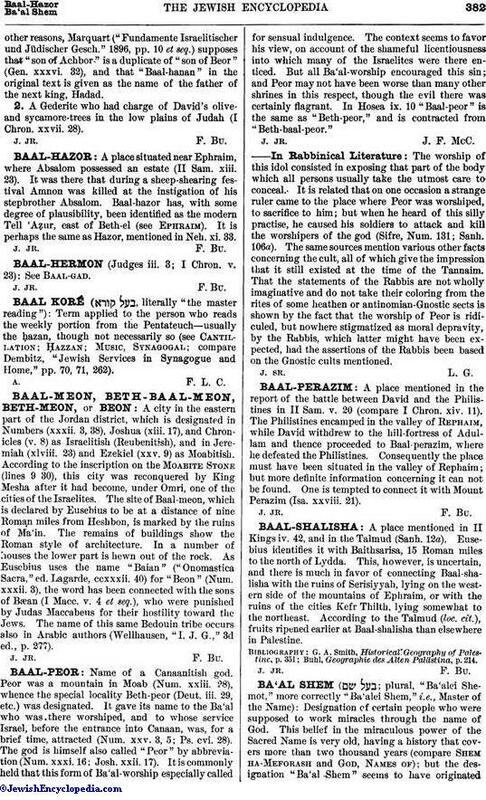 10 "Baal-peor" is the same as "Beth-peor," and is contracted from "Beth-baal-peor." The worship of this idol consisted in exposing that part of the body which all persons usually take the utmost care to conceal. It is related that on one occasion a strange ruler came to the place where Peor was worshiped, to sacrifice to him; but when he heard of this silly practise, he caused his soldiers to attack and kill the worshipers of the god (Sifre, Num. 131; Sanh. 106a). The same sources mention various other facts concerning the cult, all of which give the impression that it still existed at the time of the Tannaim. That the statements of the Rabbis are not wholly imaginative and do not take their coloring from the rites of some heathen or antinomian-Gnostic sects is shown by the fact that the worship of Peor is ridiculed, but nowhere stigmatized as moral depravity, by the Rabbis, which latter might have been expected, had the assertions of the Rabbis been based on the Gnostic cults mentioned.